Up first is Princess Buttercup which is a matte white crelly base with pink microglitter and shimmer. The base may look a little pink in the pictures, but it's just because of the pink glitter/shimmer. The base is a bit sheer, so I used 3 thin coats for the swatches above. I love the matte finish, but I find they don't last quite as long as a polish with topcoat, so I went ahead and showed it with a shiny topcoat, too. To be honest, I like it both ways! It dried quickly, and had just a tiny bit of texture with the matte finish that went away completely with topcoat. Up next is The Man in Black which is basically the black version of Princess Buttercup. I love the combination of black and pink! If you look closely at the pictures, you may be able to see some flakes in this one which isn't present in Princess Buttercup. The first coat was a bit streaky and sheer, but it built up completely with the third coat. The formula was smooth, and it dried quickly with just a hint of texture. Which do you prefer, matte or shiny? 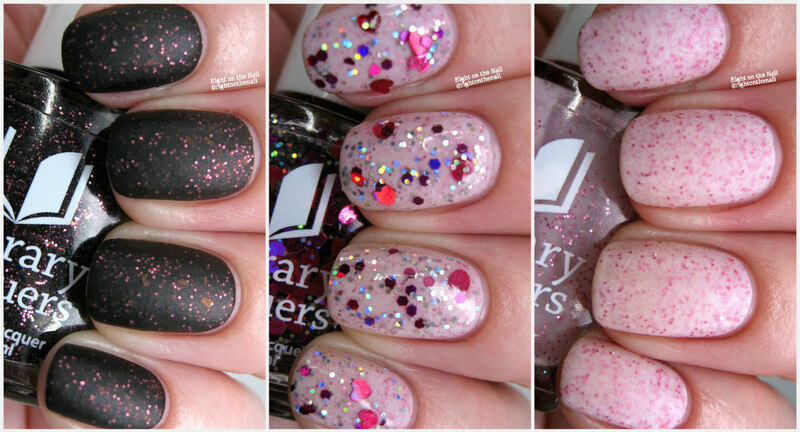 Mawage is the limited edition glitter topper available only for February. It has medium red and silver holographic hexagonal glitter with larger red and silver hearts. I recommend flipping the bottle upside down for about 30 minutes before applying to maximize the amount of hearts you'll get on the nail. I found it best to dab the polish on the nail, or you could go ahead and sponge it on. I love glitter toppers, and Amy does them so well! You may need a second coat of topcoat to smooth the hearts down completely. There you have it! Do you have a favorite? Will you be wearing them matte or shiny? These will be available this coming Friday at noon MST on the Etsy site. You can purchase them individually for $10, or as a trio for $27 while supplies last. To learn more about Literary Lacquers, check out their website, Facebook Group, Facebook page, and Instagram.